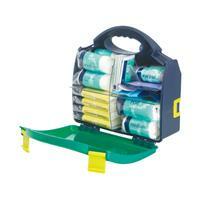 10 Person HSE Compliant first aid kit. 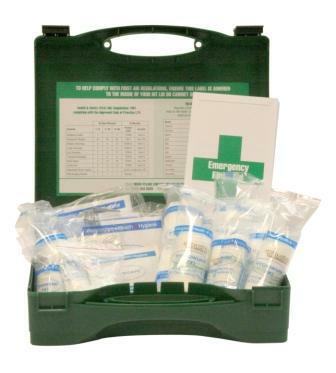 Our 10 person Premier First Aid Kit is a fully stocked HSE compliant first aid kit that meets the requirements of the Health and Safety (First Aid) Regulations 1981. An essential requirement for every workplace. Contents: First Aid Guidance Leaflet x 1Sterile Water proof plasters x 20Sterile eye pad with bandages x 2Triangular Bandages x 4Safety pins x 4Sterile dressing (medium) x 6Sterile dressing (large) x 2Antiseptic wipes x 6Disposable vinyl gloves (pair) x 1The first aid kit is supplied in a robust plastic case with carrying handle. 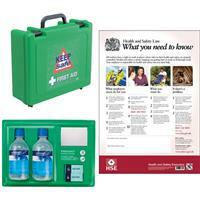 20 person Premier First Aid Kit. 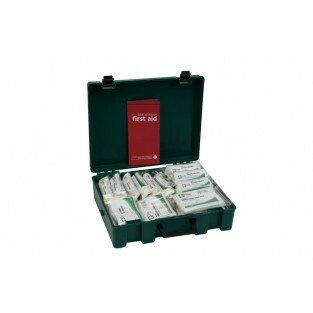 A fully stocked HSE compliant first aid kit that meets all of the requirements of the Health and Safety (First Aid) Regulations 1981. SPECIAL OFFER LOWEST PRICE! Contents: First Aid Guidance Leaflet x 1, Sterile Water proof plasters x 40, Sterile eye pad with bandages x 4, Triangular Bandages x 6, Safety pins x 12, Sterile dressing with pad (medium) x 9, Sterile dressing with pad (large) x 3, Moist wipes x 10, Disposable latex gloves (pair) x 2, The first aid kit is supplied in a robust plastic case with carrying handle. 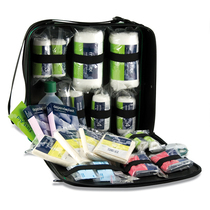 This handy travel first aid kit is ideal for those who regularly leave the main site at work. It can be conveniently stored in cars, vans and any other vehicles, and it is HSE compliant. For peace of mind, the provision of a kit with this updated content is now the only clear and definitive way for employers to demonstrate they are serious about meeting their legal obligations under the Health and Safety First Aid Regulations. Super-savings at only £14.99 for this kit! 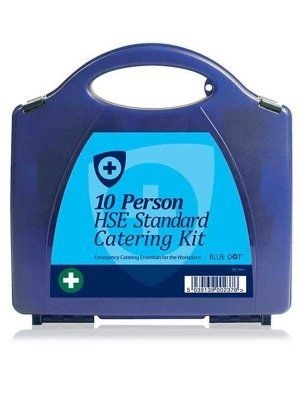 HSE Standard 10 Person Catering First Aid Kit. Durable polypropylene box with safety clips, integrated carry handle, and a secure lid provides protection from dust and water. 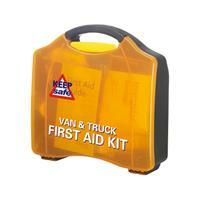 Van and Truck First Aid kit: Contents: 1 X First Aid Leaflet, 20 X Adhesive Plasters (Sterile), 2 X Triangular Bandages, 6 X Safety Pins, 1 X Medium Dressing 12 x 12cm, 1 X Large Dressing 18 x 18cm, 6 X Moist wipes, 1 X Pair of Scissors, 2 X Conforming Bandages, 1 X Support Crepe Bandage. 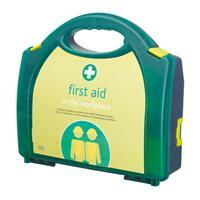 HSE First Aid Kit in Integral Aura box with superior contemporary looks. Durable polypropylene box with safety clips, integrated carry handle, and a secure lid provides protection from dust and water. 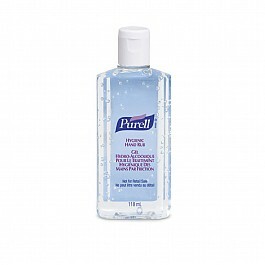 Purell Hygienic Hand Rub 118ml - Fast-acting alcohol-based hand rub makes hand hygiene compliance more practical. Works in as little as 15 seconds. No water or towels needed. Perfect solution for pandemic response. 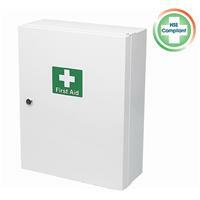 HSE First Aid Kit in Integral Aura box with superior contemporary looks. Durable polypropylene box with safety clips, integrated carry handle, and a secure lid provides protection from dust and water. All contents meet the Health & Safety Executive guidelines. 112 - HSE First Aid Kit in Integral Aura box with superior contemporary looks. Durable polypropylene box with safety clips, integrated carry handle, and a secure lid provides protection from dust and water. All contents meet the Health & Safety Executive guidelines. Contents: 20 assorted waterproof plasters, 2 sterile eyepads with bandages, 4 non-woven triangular bandages, 6 safety pins, 6 medium 12cm x 12cm sterile dressings, 2 large 18cm x 18cm sterile dressings, 6 alcohol-free hygienic wipes, pair of medium size disposable gloves, first aid guidance note. Designed for major incidents and emergencies. The bag opens like a shell to expose the myriad of loops and straps that hold each individual item in place. It allows clear identification and access to a wide range of components, ideal for emergency use. 37cmH x 37cmW x 9cmD. Available today for just £30.97! Consists of a HSE 10-person first aid kit & eyewash station in compliance with HSE guidelines, accident book and Health and Safety law poster. Ideal for small sites with up to 10 employees. 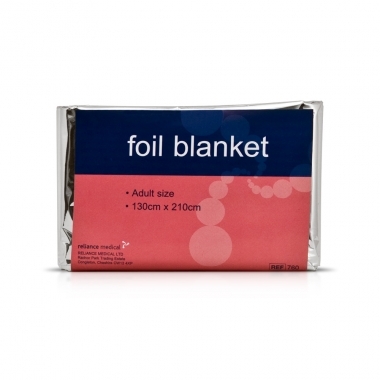 Wherever cold weather poses a threat, the Emergency Blanket (sometimes known as 'Space Blankets') can provide essential warmth; treating and preventing the onset of Hypothermia. 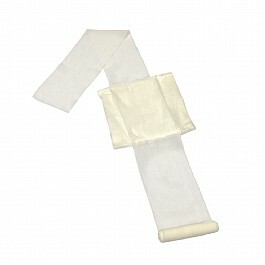 This contains a large non-medicated sterile dressing pad 18cm x 18cm attached near to one end of a bandage. After placing the pad on the wound the longer end is wrapped around the injury and then tied to the shorter end to secure. Each one is sterile and comes individually wrapped. 75p each! 100 fabric plasters of assorted sizes containing lightweight, stretchable fabric weave plaster in traditional heavyweight fabric. 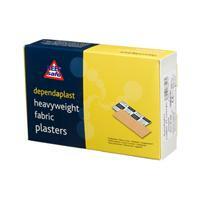 With fantastic adhesive, each plaster will cushion and protect, is sterile and individually wrapped. 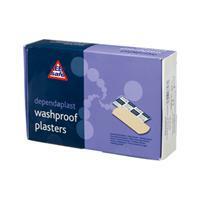 Box of 100 wash resistant plasters. 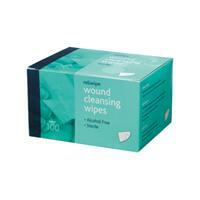 Various assorted sizes containing soft & flexible, ventilated washproof plasters. Each plaster is low allergy, sterile and individually wrapped. Assorted pack of 100 metal detectable, blue food grade catering washproof plasters. Each plaster is low allergy and latex free. Sterile and individually wrapped. 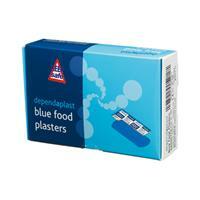 Each pack contains 100 blue food grade plasters of various sizes. 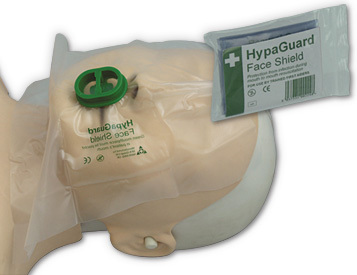 A transparent plastic film containing a one-way valve allows expired air ventilation for a safer and more effective method of resuscitation. The film acts as a barrier to help prevent infection during mouth-to-mouth resuscitation. 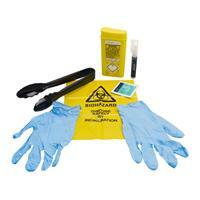 Our fully comprehensive range of PPE is budget priced yet superior quality! Just £2.75 for this mask! Metallic and non metallic objects can be removed from eyes due to the double ended design. 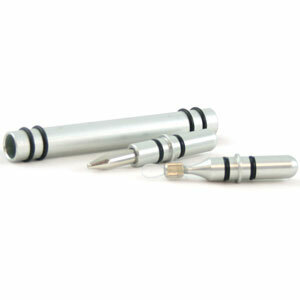 A Powerful magnet is used and allow the removal of metallic shards and small particles. Non metallic objects can be removed by the soft nylon loop. Ideal general-purpose sharps container conforming to BS7320:1990 providing maximum capacity in the minimum working space. A robust side handle prevents the container rolling for safe transportation and ease of disposal. Impressively discounted price of £4.15 each! Designed for ward or department trolleys, the SHARPSGUARD orange 0.6 mini is also ideal for community use. The container is manufactured to BS7320:1990. In stock now for a exceedingly small £3.27! These handy self adhesive First Aid helmet stickers can be applied to hard hats and safety helmets to help identify qualified first aiders in your work place and on sites. 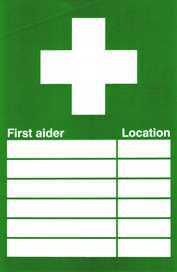 This First Aider Information poster provides employees with key details regarding who the workplace first aiders are and where the first aid kit is located. 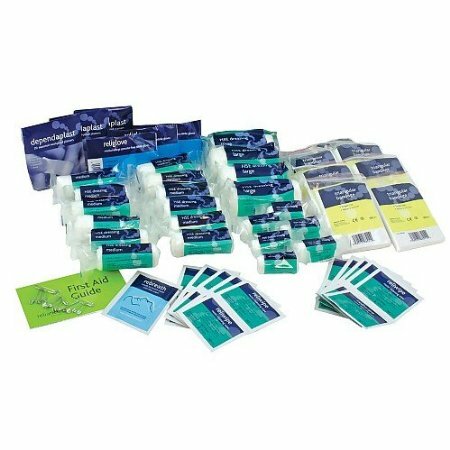 Moist Saline, alcohol free, Cleansing Wipes, suitable for any workplace and essential for every first aid and wound cleaning. The Approved Code of Practice Dressing - unboxed. A non-medicated eye pad attached near to one end of a bandage. After placing the pad over the eye, the longer end is wrapped around the patients head and then tied to the shorter end to secure. Each eyepad is sterile and comes individually wrapped. 55p each! 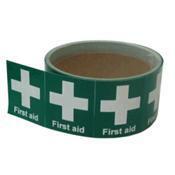 First Aid Kits, Plasters and Sharps Kits/Containers. 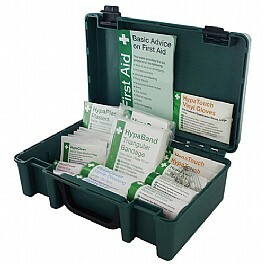 We stock a huge range of top-quality First Aid Kits for budget prices! Including 10, 20 and 50 persons kits, refill packs, plasters, Sharps Kits / Containers, van first aid kits and much much more!